Last weekend, I took Digging for Dementia on its first public outing, to the Society for Abandoned Animals‘ All-Trophy Dog Show. The SAA were lovely enough to offer me a stall at the event in order to further promote Digging for Dementia, and I had such a fantastic day! My stall was rather a mish-mash of fun things; sunflower planting, colouring, and cupcakes for sale, donated by a lovely family friend who needed some voluntary work experience to strengthen a job application. I’m happy to report that she got the job, and her awesome cakes raised £25 for Digging for Dementia! 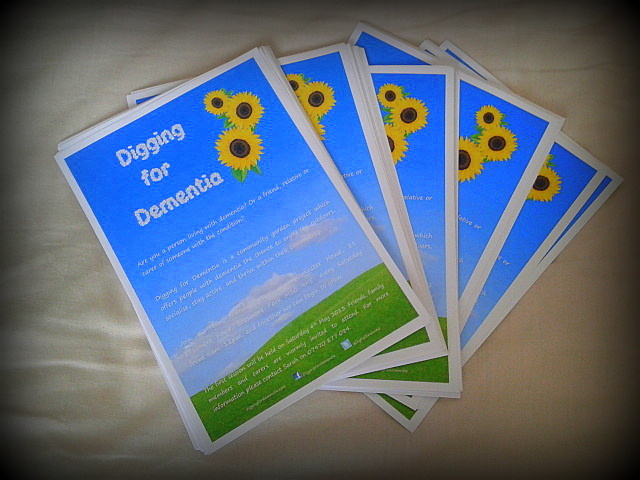 I chatted to lots of people about Digging for Dementia, and everyone was so responsive and supportive. It was really lovely to experience the public response to my little project for the first time, and it was so heartwarming to see so many positive reactions to the project. I also met some staff members and volunteers from a fantastic befriending service for older people, and I’m really excited about the possibility of working with them in the future. The Society for Abandoned Animals delivered such an enjoyable event, and I was really proud to be a part of it. I can’t wait to take Digging for Dementia out on the road again in the near future! 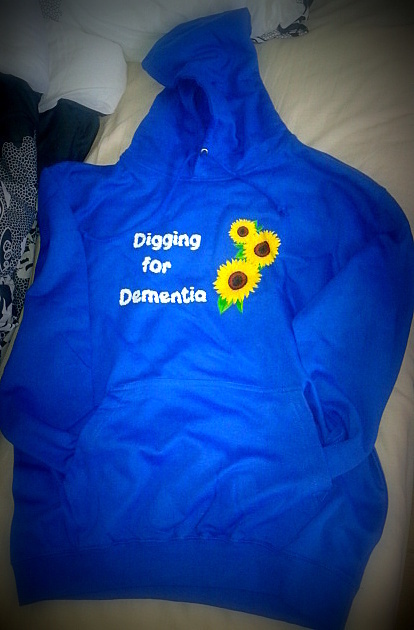 Please follow Digging for Dementia on Twitter for updates regarding future events. And now, some photos of the day’s festivities for your viewing pleasure. Enjoy! The stall, ready and waiting for visitors! Tags: community, community garden, dementia, digging for dementia, manchester, mental health, society for abandoned animals | Permalink. Hello, lovely readers! Firstly, I apologise for the recent silence; the cogs have been turning over at Digging for Dementia HQ, but the day job has been keeping me rather busy. I do, however, have some fantastic news about the future of the project! Digging for Dementia has been gathering an incredible amount of momentum since I first established the project in March, and although I’ve been able to successfully lay the foundations for the project, plan its development and raise funds to purchase equipment, the struggles I’ve experienced when trying to obtain land have highlighted that Digging for Dementia has expanded too much for the project to remain a one-woman operation. Last week, I had a very exciting meeting with Action for Sustainable Living, a South Manchester-based environmental charity, and I’m going to be working with them on a voluntary basis as a Local Project Manager, delivering Digging for Dementia with the support of AfSL’s wonderful staff and extensive resources. Finding land for the project has proven to be immensely difficult, and Action for Sustainable Living have offered to use their contacts to help me to obtain a plot of land, which is fantastic. I’ll also be given training to build on the skills I developed at Groundwork, which will help me to run the project even more successfully, and I’ll be able to work with other members of the AfSL team to offer additional activities and enrichment for the people participating in my project. I’m so excited to have found a new home for Digging for Dementia within such a supportive environment, and I can’t wait to work alongside a team of smart, creative, like-minded people to take the project to the next level. Digging for Dementia will still be my baby, but by working with such a lovely group of people, I’ll be able to develop the project to a level beyond anything I could have achieved on my own. I have a feeling that this will be huge for Digging for Dementia, so stay tuned for updates. Onwards and upwards! Tags: action for sustainable living, community, community garden, dementia, digging for dementia, manchester | Permalink. It’s been a tremendously busy week at Digging for Dementia HQ! As I recently announced, the launch of the project has been postponed as the land that was offered to the project is no longer available to us, but Digging for Dementia is still going ahead, and I’m currently in talks with two different organisations regarding offers of land, so watch this space! I completed my First Aid for Adults training course this week, which has prepared me nicely for any emergencies or gardening-related injuries that may occur during the project. You can never be too careful! My instructor was lovely, and took the time to provide some additional training related to injuries which might happen during the gardening sessions, in addition to health emergencies which might affect older people. I had a fantastic time on the course, and learnt a lot. I feel prepared to take the best possible care of the group when the practical sessions begin! I’m also going to be delivering a presentation about the project at one of the Alzheimer’s Society’s Dementia Cafe sessions in a couple of months, and I can’t wait to visit the cafe and chat to the people who visit the sessions. Hopefully I’ll be able to find out more about what people would hope to gain from Digging for Dementia, and the experience will help me to develop the project further, and make more people aware of how the project could help them. Very exciting! 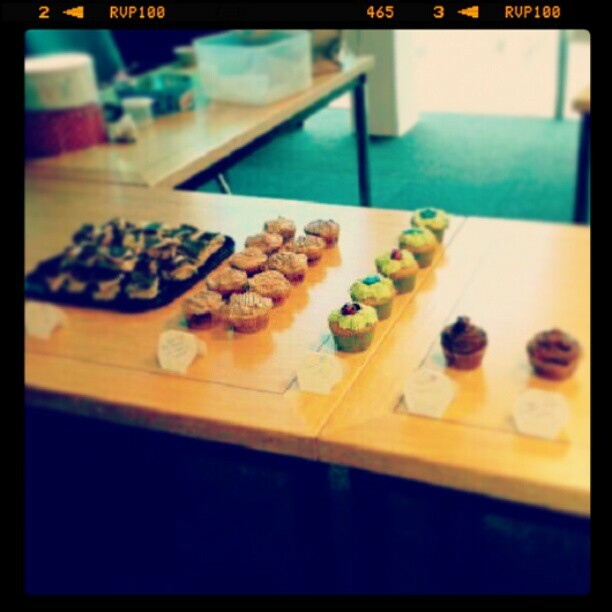 The bake sale in action; many of the cakes had already been devoured by this point! 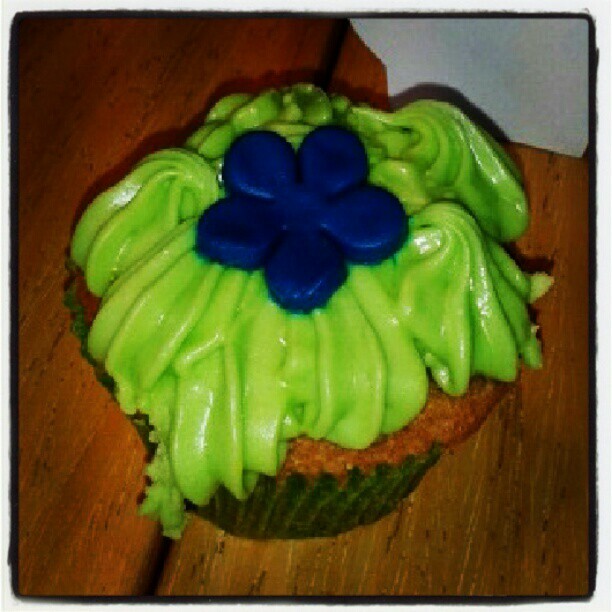 Just one of Jam Jar Bakes’ lovely creations, with garden-themed decorations made from icing! 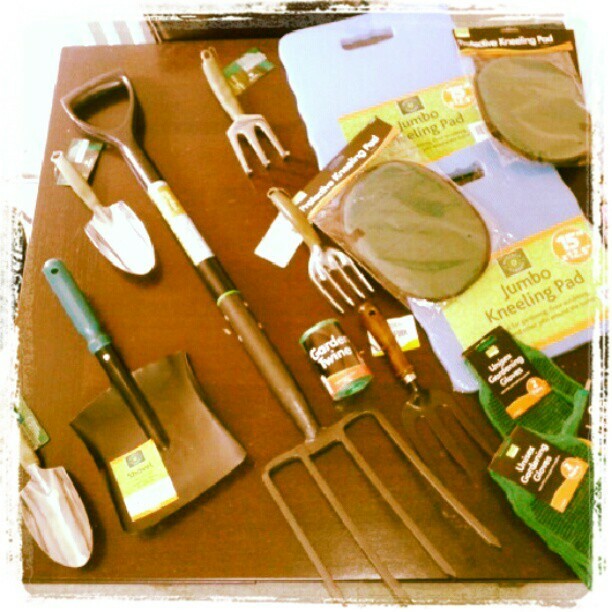 Today I’ve been shopping for gardening equipment, using some of the proceeds from yesterday’s sale. Thanks to some savvy shopping, I managed to get this lovely lot for around £22! This equipment, added to the few bits and bobs I’ve collected for the project already, means that we’re pretty much stocked up and ready to go! I’ve also ordered a large first aid kit, and a few extra bits to add to the kit, ready to be taken to the site when the Digging for Dementia sessions begin. I still have around £20 of the bake sale money left, which will be squirrelled away to be spent on seeds when the project has another start date. In the interests of accountability, I’ve added a list of the items I bought using the proceeds from the sale, which can be found in the Gallery section of the website. Yesterday’s bake sale has been so valuable to Digging for Dementia, and has really fuelled the project. None of it would have been possible without Jam Jar Bakes, so please show your thanks by checking out her website, following her on Twitter, and sending her huge cyber-hugs of gratitude! I’d like to say a huge thank you to everyone who’s supported the project so far, whether by fundraising, spreading the word about the project throughout dementia care networks (the project is becoming quite famous!) or simply sending kind words of support via Twitter and Facebook. It’s quite overwhelming to know that Digging for Dementia has such an incredible amount of support, and I’m incredibly grateful to everyone who’s pitched in so far. Onwards and upwards! Tags: cakes, community, community garden, dementia, digging for dementia, fundraising, jam jar bakes, manchester | Permalink. Due to unforeseen circumstances, the first Digging for Dementia session will not be going ahead on Saturday May 4th. The project itself will still continue, and fundraising efforts will go on as planned. Details of the rescheduled first session will be confirmed soon. I apologise for the delay, and will provide further details soon. Tags: community, community garden, dementia, manchester | Permalink.